Malilla - thanoscardgamess jimdo page! Malilla is a point-trick game for four players in fixed partnerships. It is popular in Mexico, and comes from Spain, where it is nowadays often known as Manilla. You can play it with the Spanish 40-card pack, or with 40 cards from the French suited (standard) 52-card pack.The high cards have point values, the ainm being to win these scoring cards in tricks. 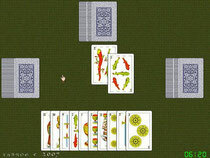 The player to dealer's left leads to the first trick. Any card may be led, and players must follow suit if possible. Each trick is won by the highest trump in it, or if no trumps are played by the highest card of the suit led. The winner of the trick leads to the next trick. Each team keeps the tricks they have won in a single pile. When all ten tricks have been played, each team counts the value of cards in the tricks they have won, plus one point for each trick they won.